It is a stalwart tradition in Burgundy to "put down" bottles of wine in memory of special events, such as a child's birth, a baptism, graduating from high school, getting engaged, getting married, publishing a first book, running around the block in your underwear (or better yet, naked)...really, whatever rite of passage is important to a person and/or a family. Franck and I were gifted amazing bottles of wine at our wedding in Burgundy - many from Franck's family and friends who were winemakers. Generally wines given at a wedding ceremony are enjoyed at the births or baptisms (or both, we got A LOT of wine) of children and special wedding anniversaries. Bottles given to children on the occasion of their births are often opened when our "babies" turn eighteen or graduate from high school. Some are saved for their weddings as well. This tradition can be adapted to any rites of passage that are important in a particular human journey. The important thing is that keepsake bottles of wine are meaningful, not to mention delicious, ways to celebrate the steps of life. Make sure you purchase wine that will age well. Of course I recommend a good vintage of Burgundy pinot noir, but then again I may be slightly biased. Audrey Tatou (who - funny story - is going out with the son of my ob/gyn in Beaune who delivered Clémentine and who I write about in my memoirs) showing off the effortless chic of the marinière in a still from the movie Coco Before Chanel. Pretty much every French woman I know has a good-quality marinière in their closet. A marinière is the french name for the traditional white and blue striped top (though it now comes in a myriad of colors) which has been worn for centuries by french fishermen, especially the ones who hail from Brittany. A good marinière should fit you comfortably and be a thick enough weave to keep you warm underneath your coat on a blustery day. They look effortlessly chic with jeans and flats or sandals, and equally good with a pair of rubber boots in the winter. They are perfect for men, women, and look adorable on children of any age. In the summer on the french coast you will often spot whole families dressed in marinières. My favourite brand of marinière is made by the wonderful french brand Amor-Lux which began in Quimper, Brittany. They are incredibly sturdy, soft, and their fit is pretty much parfait. They distribute all over the world, so you should be able to get your hands on one and inject some french style into your wardrobe no matter where you live. In french households I have lived in family members fight - sometimes a lot. There is definitely a thing as too much or abusive fighting, but I'm talking about a periodic blow-up between equal partners. Before living in France I probably repressed my urge to fight to my disadvantage. In my case, it manifested in anxiety and futile attempts to remove any source of conflict from my everyday interactions with others. That wasn't healthy for me as it turned out. Now, when people ask me about our home life I say it is joyful but that it definitely includes fighting. As I write about in all my Grape memoirs Franck and I are not one of those couples who never say a cross word to each other. We both have fiery personalities and a stubborn streak a mile wide so clashes happen frequently. However, we always end up laughing about them afterwards. We often reminisce about an epic fight we had in the chic restaurant Les TonTons on Beaune's Place Madeleine a couple of summers ago. I honestly can no longer remember exactly what we were fighting about, but we kept it up during five courses and terrorized the waiting staff. Now we are in stitches whenever we think about it. Sadly, though, it means we can never show our faces in Les TonsTons again despite the food being fantastic. I love how for the french getting mad from time to time is just part of normal life - not the end of the world or something to be repressed at all costs. Like storm clouds fights blow over, blow past, and eventually leave us laughing. Pivoine (peony) season at the Saturday market in Beaune, Burgundy, France. No french person I know would arrive as a dinner guest without bringing a lovely bouquet of flowers to the host. 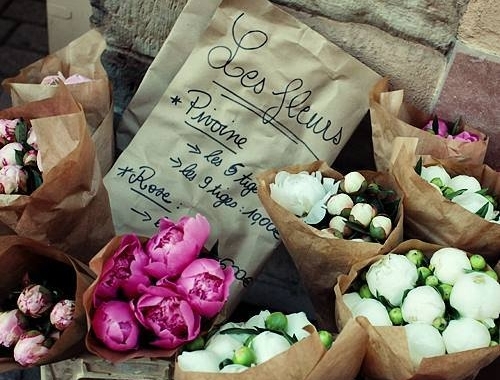 Living in France makes this easy with gorgeous fleuristes everywhere and gobs of incredible seasonal flowers at the markets. Here I like buying a little plant like a potted succulent or an orchid or something that has a chance of lasting a while. One of the best gifts I received recently from a friend is a potted aloe vera plant from the "babies" that have sprouted off her own aloe vera at home. Living in Canada I have gotten lazy with this habit and I am determined to make an effort to start doing it again. Who, after all, doesn't find flowers brighten up their day? Our summer tomato tart made with Charlotte's homemade pastry recipe below. This last one is similar to my encouragement a few weeks ago to make your own vinaigrette. I had the idea of adding my pastry recipe to my "french habits" list because one of my favourite readers (who also happens to be a chef) asked for it - bonjour Erin! *waving* Also, aren't we all seeking practical ways to cook from scratch? All my friends know that I am absolutely, without a doubt, the first person to take advantage of short-cuts on the domestic front. However, this recipe, bequeathed to me by my trés French, trés talented friend Charlotte Buffet ("Marie" in My Grape Village), is a pastry recipe so dead easy that even I make it often. It takes about two minutes, never fails, and garners rave reviews every time. To quote Charlotte directly, using this recipe for homemade Pâte Brisée when making any kind of quiches, fruit, or vegetable tarts “fait toute la différence.” It is the difference between a ho-hum tarte aux pommes and one that makes you want to kiss the person sitting next to you. This recipe is what my French Habits posts are all about – emphasis on those little details that provide a heady effort / pleasure ratio. Instructions - Brace yourselves. This is really tough. – Measure ingredients and add in no particular order into food processor. – Press on “mix” button until ingredients have formed ball-like object which has detached from sides – takes about a minute or two. – Remove pastry (voilà, you have just made pastry!) ball from food processor, flatten into disc, wrap in cellophane and put in fridge for at least an hour before using. *Lasts 3-4 days in the fridge and freezes wonderfully, so you can always have some pastry on hand. ** If you don't have a food processor you can do this in a Kitchen-Aid type mixer with the "K" mixing attachment OR in a humble bowl and mix together with clean hands until you can stick it all together in a ball. Have amour for this post? Sign up with your email to receive blog posts and be entered to win a free week in the vineyards of Burgundy, France. Enjoy this? Check out my bestselling Grape Series of books - available in both digital and paperback.